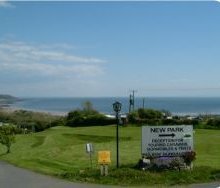 If you dont fancy visiting any of the great locations in and around Porthcawl you can enjoy a pleasant evening at the club and / or bar which is available at Trecco Bay Holiday Park - perfect convenience for your holiday. When you book a holiday at Trecco Bay Holiday Park you get the best of both worlds. A self catering holiday gives you the freedom of being able to explore all the delights Porthcawl and Glamorgan has to offer with out being tied down to meal times...And for the times when you don't want to cook you can treat yourself at the Trecco Bay Holiday Park restaurant. Of course you can always eat out at the local pubs and restaurants as well!. At Trecco Bay Holiday Park there is a takeaway on the holiday park. This means that if you don't want to eat out or cook you have the third option of a takeaway. Want a Glamorgan golf break or holiday? Then booking a holiday or break at Trecco Bay Holiday Park could be a great solution. There is a golf course on the park or near by. And with plenty for non golfers to do either at Trecco Bay Holiday Park or in and around the Porthcawl area the non golfers will have a great time too. 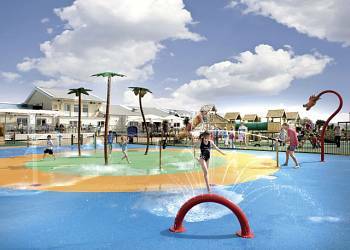 If you are looking to book a family holiday then Trecco Bay Holiday Park could be the perfect answer. Trecco Bay Holiday Park has a children's play area which is ideal for kids to burn off excess energy and make friends with the other children enjoying their Glamorgan holiday. If you are booking a longer holiday at Trecco Bay Holiday Park then it's still possible to pack light. The on park launderette will help you make the most of the clothes you have packed. Trecco Bay Holiday Park's indoor swimming pool is a fantastic facility for those who enjoy a swim what ever the weather. There is some great cycling opportunities both locally around Porthcawl or popular cycle routes in Glamorgan. Trecco Bay Holiday Park has facilities on the park to make it easier for wheelchair users or guests with disabilities. There is no reason to leave your pets behind because at Trecco Bay Holiday Park they welcome well behaved pets. Trecco Bay Holiday Park understands that a family holiday means all the members of your family including your dog. You also get to save money as well as we all know that kenels can be pretty expensive. There is also plenty to do around Porthcawl for both you and your dog. Enjoy a few hours in the games room at Trecco Bay Holiday Park. When you book check out what games are available in the games room to make sure that your favourite games are available. The games room is an ideal way to spend a few hours what ever the weather. If you need to catch up with emails or want to surf the web while holidaying at Trecco Bay Holiday Park then you will find the wifi or internet access very useful. For more details please check when you book. Another option for internet access is to search for wifi hotspots in Porthcawl or CF36 5NG. You can also check mobile broadband coverage as well if internet access is important to you. There is a food shop at Trecco Bay Holiday Park. So there is no need to hunt for a shop in Porthcawl or further afield around Glamorgan for those daily essentials. Brecon  Three bedrooms  Sleeps 6–8  New in 2016. 12ft-wide caravan with one double with ensuite shower and two twin. Additional sleeping for two in the lounge area. Contemporary style central lounge area. DVD and soundbar. Washer/dryer. Double glazed and centrally heated. Verandah with outdoor furniture. Laleston  Two bedrooms  Sleeps 4–6  New in 2016. 12ft-wide caravan with one double with ensuite bath and one twin. Additional sleeping for two in the lounge area. DVD and soundbar. Fridge/freezer. Double glazed and centrally heated. Verandah with outdoor furniture. Contemporary 3 Bed  Three bedrooms  Sleeps 6  Contemporary and spacious lodge style holiday home with one double with TV and two twin. DVD/CD. Dishwasher. Verandah. Southerndown Lodge  Three bedrooms  Sleeps 6  Lodge with one double with ensuite shower and two twin. DVD/CD. Dishwasher and washer/dryer. Double glazed and centrally heated. Verandah with outdoor furniture. Caldey  Three bedrooms  Sleeps 6–8  New in 2017. 12ft-wide caravan with one double and two twin. Additional sleeping for two in the lounge area. Freeview/DVD and soundbar. Fridge/freezer. Double glazed and centrally heated. Aberdulais  Two bedrooms  Sleeps 4–6  12ft-wide caravan with one double with ensuite shower and one twin. Additional sleeping for two in the lounge area. Freeview/DVD. Dishwasher, fridge/freezer and washer/dryer. Double glazed and centrally heated. Verandah with outdoor furniture. No pets. Caldey WF  Two bedrooms  Sleeps 4–5  New in 2017. Spacious 12ft-wide caravan with two twin. Additional sleeping for one in the lounge area. Freeview ands soundbar. Fridge/freezer. Double glazed and centrally heated. Suitable for parties including visitors with partial disabilities – please check when booking. No pets. St Hilary  Three bedrooms  Sleeps 6–8  New in 2017. 12ft-wide modern caravan with one double and two twin. Additional sleeping for two in the lounge area. DVD and soundbar. Double glazed and centrally heated. No pets. Penderyn Lodge  Four bedrooms  Sleeps 8  New in 2017. Lodge style holiday home with two double, both with ensuite shower and two twin. Dishwasher and washer/dryer. Double glazed and centrally heated. Verandah. No pets. 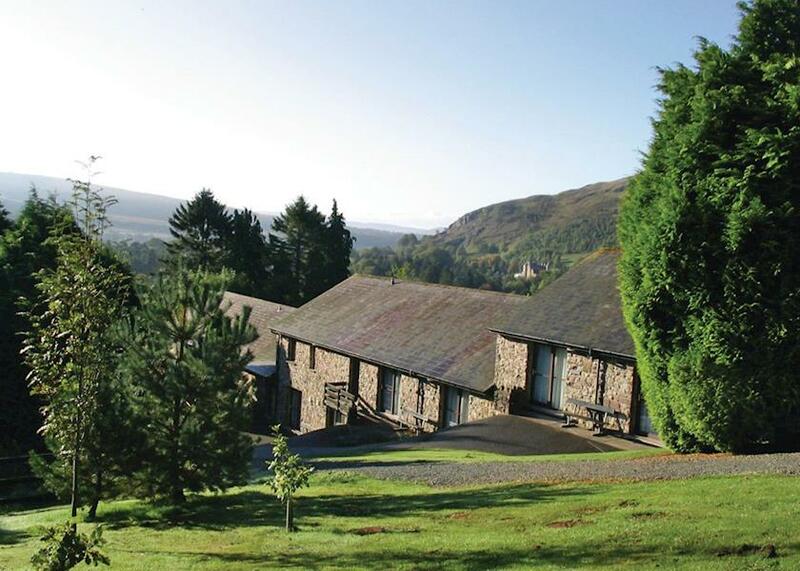 Knighton Lodge  Three bedrooms  Sleeps 6-8  Modern lodge with two doubles and one twin. Washer/dryer. Additional sleeping for two in the lounge area. Verandah. No pets. Rhondda WF  Two bedrooms  Sleeps 4  Lodge style holiday home with one double and one twin. Verandah. Suitable for parties including visitors with partial disabilities – please check when booking. No pets. Newton  Three bedrooms  Sleeps 6–8  Caravan with one double and two twin. Additional sleeping for two in the lounge area. Heating in bedrooms. Nottage  Three bedrooms  Sleeps 6–8  12ft-wide caravan with one double and two twin. Additional sleeping for two in the lounge area. Ogmore  Two bedrooms  Sleeps 4–6  12ft-wide caravan, with one double and one twin. Additional sleeping for two in the lounge area. DVD. Pembroke  Three bedrooms  Sleeps 6–8  12ft-wide caravan with one double and two twin. Additional sleeping for two in the lounge area. DVD and soundbar. Double glazed and centrally heated. Heated towel rail or radiator in shower room. Verandah with outdoor furniture. No pets. Coity  Three bedrooms  Sleeps 6–8  12ft-wide caravan with one double and two twin. Additional sleeping for two in the lounge area. DVD/CD. Double glazed and centrally heated. Heated towel rail or radiator in shower room. Rhondda  Two bedrooms  Sleeps 4–6  12ft-wide caravan with one double and one twin. Additional sleeping for two in the lounge area. DVD/CD. Double glazed and centrally heated. Heated towel rail or radiator in shower room. Caerphilly  Two bedrooms  Sleeps 4–6  Caravan with one double and one twin. Additional sleeping for two in the lounge area. Heated towel rail or radiator in shower room. Neath  Two bedrooms  Sleeps 4–6  12ft-wide caravan with one double and one twin. Additional sleeping for two in the lounge area. DVD/CD. Double glazed and centrally heated. Heated towel rail or radiator in shower room. Cornelly  Three bedrooms  Sleeps 6–8  12ft-wide caravan with one double with ensuite shower and two twin. Additional sleeping for two in the lounge area. DVD/CD. Double glazed and centrally heated. Heated towel rail or radiator in shower room. Verandah with outdoor furniture. Maesteg  Two bedrooms  Sleeps 4–6  12ft-wide caravan with one double and one twin. Additional sleeping for two in the lounge area. Heating in bedrooms. No pets. Neath WF  Two bedrooms  Sleeps 4–5  12ft-wide caravan with one double and one twin. Additional sleeping for one in the lounge area. Double glazed and centrally heated. Suitable for parties including visitors with partial disabilities – please check when booking. Gower  Two bedrooms  Sleeps 4–6  Comfortable caravan with one double and one twin. Additional sleeping for two in the lounge area. DVD/CD. Double glazed and centrally heated. Llanfair  Three bedrooms  Sleeps 6–8  Comfortable caravan with one double with ensuite shower and two twin. Additional sleeping for two in the lounge area. DVD/CD. Washer/dryer. Double glazed and centrally heated. Verandah. Bedford  Four bedrooms  Sleeps 8  Comfortable 12ft-wide caravan with one double and three twin. Double glazed and centrally heated. Kenfig  Three bedrooms  Sleeps 6–8  12ft-wide caravan offering the very latest in comfort. One double and two twin. Additional sleeping for two in the lounge area. DVD/CD. Double glazed and centrally heated. Coychurch  Two bedrooms  Sleeps 4–6  Caravan with one double and one twin. DVD/CD. Additional sleeping for two in the lounge area. Double glazed and centrally heated. Kenfig WF  Two bedrooms  Sleeps 4–6  12ft-wide caravan with one double and one twin. Additional sleeping for two in the lounge area. DVD/CD. Double glazed and centrally heated. Shower with seat. Wider sliding doors and ramp access. Suitable for parties including visitors with partial disabilities – please check when booking. No pets. Penarth  Two bedrooms  Sleeps 4–6  12ft-wide caravan with one double and one twin. Additional sleeping for two in the lounge area. DVD/CD. Double glazed and centrally heated. Dunraven WF  Two bedrooms  Sleeps 4–6  12ft-wide caravan with one double and one twin. Shower with shower seat and grab rail. Additional sleeping for two in the lounge area. Freeview/DVD/CD and soundbar. Double glazed and centrally heated. Wider internal sliding doors and ramp access. Suitable for parties including visitors with partial disabilities – please check when booking. No pets. Margam  Two bedrooms  Sleeps 4–6  Caravan with one double and one twin. Additional sleeping for two in the lounge area. Freeview/DVD/CD. Fridge/freezer. Double glazed and centrally heated. No pets. Llandaff  Three bedrooms  Sleeps 6–8  New in 2016. Caravan with one double and two twin. Additional sleeping for two in the lounge area. Freeview/DVD and soundbar. Fridge/freezer. Double glazed and centrally heated. Dunraven  Three bedrooms  Sleeps 6–8  12ft-wide caravan with one double and two twin. Additional sleeping for two in the lounge area. Freeview/DVD/CD and soundbar. Fridge/freezer. Double glazed and centrally heated. We have 130 reviews for Trecco Bay Holiday Park. A random selection of 3 are shown for your information. Refresh the page to get another 3 reviews to show. Trecco Bay was fantastic, we did not even need to leave the site, the entertainment was first class and the staff went out of their way to make everything special for us. We were placed in a fabulous spot on the site, near to everything. 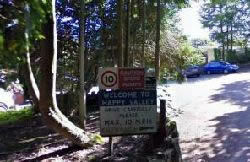 Fantastic family holiday park, so much to do! Would recommend to all families! We had a great time with lots to keep us busy. Have you been to Trecco Bay Holiday Park? Please share your views with others who are considering staying at Trecco Bay Holiday Park so that they can benefit from your experience and get the best from their holidays. Important note: Information provided here about Trecco Bay Holiday Park is based on our best knowledge. However, please check with Trecco Bay Holiday Park before booking to ensure that you have the information required. Reviews are the sole views of the contributor and do not necessarily represent the views of gocaravannung.com or Trecco Bay Holiday Park.